Finally I have gotten the chance to polish up and release a new plug-in. This one is a ring modulator called Dyner (ring modulation is basically a type of heterodyning). I’ve spoken about this effect in a previous blog post, but just to quickly summarize, ring modulation is accomplished by multiplying a modulator signal (usually an oscillator of some kind) with the carrier signal (the audio). By itself it’s a very easy and straightforward operation, but unless you’re only modulating with a sine wave, aliasing becomes a big issue to deal with. Many free ring modulators that I’ve tried do not tackle this problem in any way, so I was determined to do so in Dyner. This meant writing my own resampler to handle the oversampling of the operation. As I outlined in previous posts regarding resampling, this was no mean feat in making sure the process was accurate and efficient. However, without regard to the oscillator itself, a very strong anti-aliasing filter would be required, severely impacting the CPU load and execution of the effect. The next task was then to create fully band-limited oscillators. In this plug-in I’m just using the wavetable approach, with each oscillator using 10 different tables calculated with a unique number of harmonics appropriate for the octave range so they don’t alias. Now that it was ensured that the oscillators themselves would obey the sampling theorem, oversampling by 2X using a light filter is so far giving good results. The plug-in (VST 2.4, for both Mac and Windows, 32-bit & 64-bit) can be downloaded for free in Downloads. This entry was posted in Audio, Plug-In and tagged DSP, Dyner, Mac, plug-in, ring modulation, VST, Windows on March 6, 2013 by Chris. Now as I am looking into and learning more about digital reverberation, including its implementation and theory, I decided to build a simple comb filter plug-in using Audio Units. Previously all the plug-in work I’ve done has been using VST, but I was anxious to learn another side of plug-in development, hence Apple’s Audio Units. It is, truth be told, very similar to VST development in that you derive your plug-in as a subclass of Audio Unit’s AUEffectBase class, inheriting and overwriting functions accordingly to the needs of your effect. There are some notable differences, however, that are worth pointing out. In addition, I’ve put up the plug-in available for download on the Downloads page. The structure of an Audio Unit differs from VST in that within the main interface of the plug-in, a kernel object that is derived from AUKernelBase handles the actual DSP processing. The outer interface as subclassed from AUEffectBase handles the view, parameters, and communication with the host. What’s interesting about this method is that the Audio Unit automatically handles multichannel audio streams by initializing new kernels. 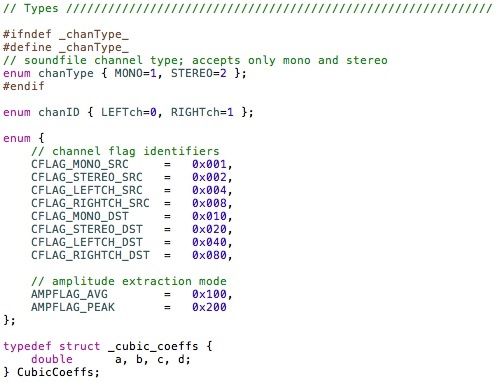 This means that the code you write within the Process() function of the kernel object is written as if to handle mono audio data. When the plug-in detects stereo data it simply initializes another kernel to process the additional channel. For n-to-n channel effects, this works well. Naturally options are available for effects or instruments that require n-to-m channel output. Another benefit of this structure is the generally fast load times of Audio Unit plug-ins. The plug-in’s constructor, invoked during its instantiation, should not contain any code that requires heavy lifting. Instead this should be placed within the kernel’s constructor, the initialization, so that any heavy processing will only occur when the user is ready for it. Acquring the delay buffer in the comb filter happens in the kernel’s constructor, as indicated below, while the plug-in’s constructor only sets up the initial parameter values and presets. The parameters in Audio Units also differ from VST in that they are not forced to be floating point values that the programmer is responsible for mapping for the purpose of displaying in the UI. Audio Units comes with built-in categories for parameters which allow you to declare minimum and maximum values for in addition to a default value that is used for when the plug-in instantiates. 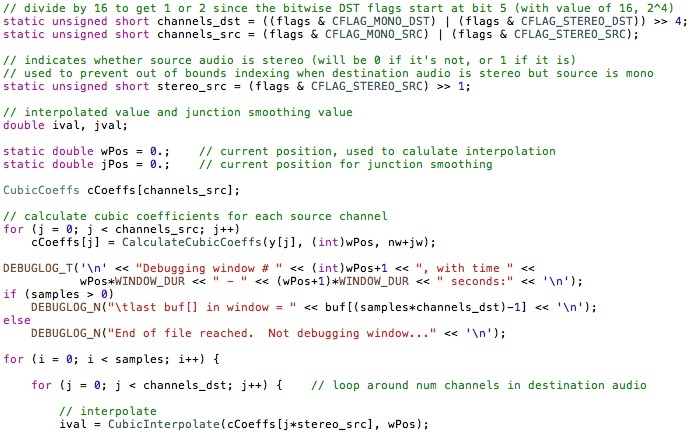 Like VST, Audio Units contains a function called Reset() that is called whenever the user starts or stops playback. This is where you would clear buffers or reset any variables needed to return the plug-in to an initialized state to avoid any clicks, pops, or artifacts when playback is resumed. Because a comb filter is essentially a form of delay, a circular buffer is used (mDelayBuf) to hold the delayed audio samples. In real-time processing where the delay time can change, however, this has repercussions on the size of the buffer used, as it would normally be allocated to the exact number of samples needed to hold the data. 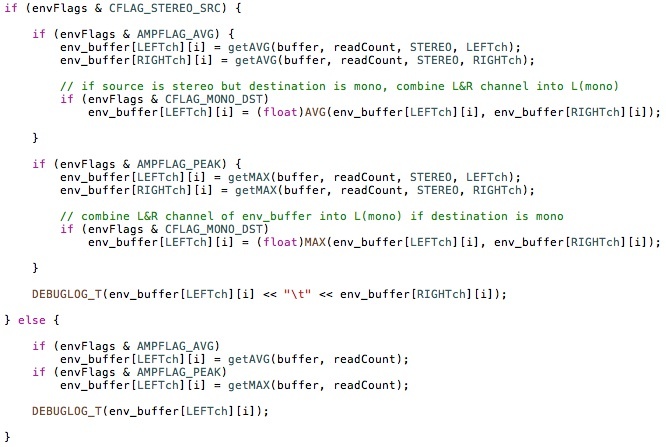 But rather than deallocating and reallocating the delay buffer every time the delay time changes (requiring multiple memory accesses), I allocate the buffer to its maximum possible size as given by the maximum value allowed for the delay time. As the delay time changes, I keep track of its size with the curBufSize variable, and it is this value that I use to wrap around the buffer’s cursor position (mPos). 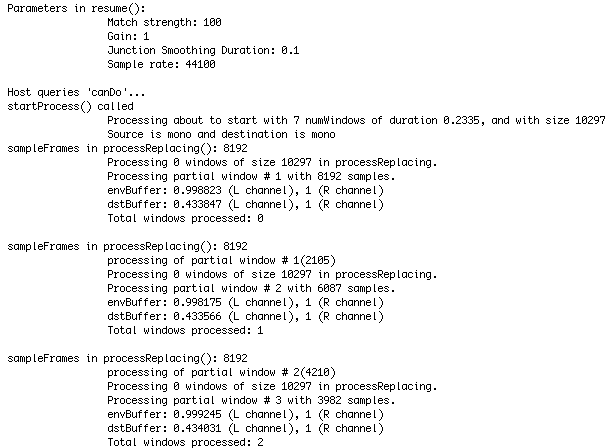 This happens within the Process() function. Every time Process() is called (which is every time the host sends a new block of samples to the plug-in), it updates the current size of the buffer and checks to make sure that mPos does not exceed it. The unfortunate consequence of varying the delay time of an effect such as this is that it results in pops and artifacting when it is changed in real time. The reason being that when the delay time is changed in real time, samples are lost or skipped over, resulting in non-contiguous samples causing artifacting. This could be remedied by implementing the Comb Filter as a variable delay, meaning when the delay time changes in real time, interpolation is used to fill in the gaps. As it stands, however, the delay time is not practically suited for automation. 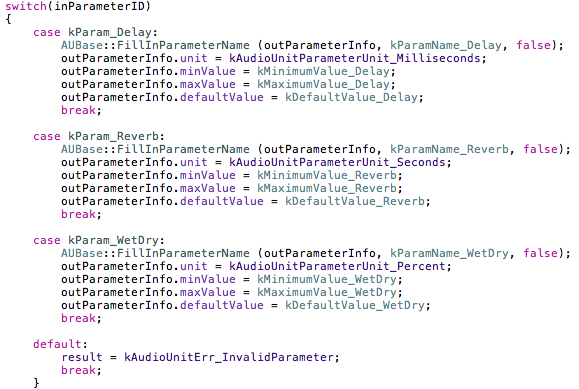 Yet another distinction with Audio Units is the requirement for validation to be usable in a host. 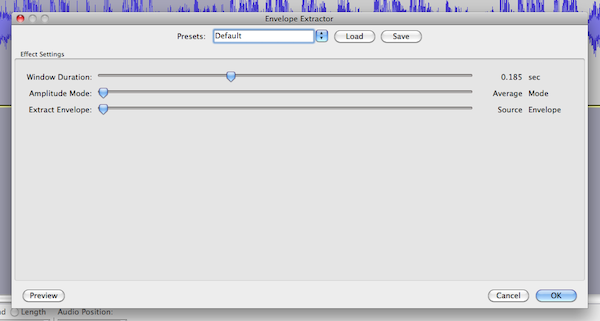 Audio Units are managed by OS X’s Component Manager, and this is where hosts check for Audio Unit plug-ins. To validate an Audio Unit, a tool called “auval” is used. This method has both pros and cons to it. The testing procedure helps to ensure any plug-in behaves well in a host, it shouldn’t cause crashes or result in memory leaks. While I doubt this method is foolproof, it is definitely useful to make sure your plug-in is secure. Correction: Audio Units no longer use the Component Manager in OS X 10.7+. Here is a technical note from Apple on adapting to the new AUPlugIn entry point. The downside to it is that some hosts, especially Logic, can be really picky with which plug-ins it accepts. I had problems loading the Comb Filter plug-in for the simple reason that version numbers didn’t match (since I was going back and forth between debug and release versions), and so it failed Logic’s validation process. To remedy this, I had to clear away the plug-in from its location in /Library/Audio/Plug-Ins/Components and then, after reinstalling it, open the AU Manager in Logic to force it to check the new version. This got to be a little frustrating after having to add/remove versions of the plug-in for testing, especially since it passed successfully in auval. Fortunately it is all up and running now, though! Finally, I’ll end this post with some examples of me “monkey-ing” around with the plug-in in Logic 8, using some of the factory presets I built into it. This entry was posted in Audio, Programming and tagged Apple, AU, Audio Units, auval, C/C++, circular buffer, class, comb filter, delay, DSP, Logic, plug-in, VST on September 10, 2012 by Chris. In this post I’m going to discuss two new features I have added to the Match Envelope plug-in that I’m pretty excited about. And with some additional bug fixing, it’s in a good workable state, so I can offer up the plug-in as a Beta version. The first of the new features I added is an option to invert the envelope, so instead of matching the source audio that you extract the envelope from, the resulting audio is opposite in shape. Of course this can further be tweaked by use of the “match strength” and “gain” parameters. The actual process of doing this is very simple; take the interpolated value (from cubic interpolation) ‘ival’ and subtract it from 1 (digital waveforms in floating point representation all have sample values between -1 to 1). As simple as this was, it did introduce a bug that took a long time to find. it will result in an imaginary number when matchStr is around 0.5. In essence, this part of the formula ends up trying to square-root a negative number. The easy fix for this was just to take the absolute value of ‘ival’ such that pow(fabs(ival), matchStr)) will then never result in nan. This is a better solution than to just “floor” ival to 0 if it is negative because this will actually alter the audio slightly by messing with the interpolation. The second feature I added is a “window offset” parameter, which shifts the envelope left or right. Oddly enough, this one took less time to implement and required less testing/fixing than the invert feature even though it sounds more complex to code. In fact, it’s pretty simple as well. Similar to a circular buffer, instead of shifting the elements around in the buffers that contain the envelope data, I just offset the cursor that points to the location in the buffer. If I want to shift the envelope to the left (the result will in effect anticipate the source audio’s envelope), the cursor needs to be offset by a positive number. If I want to shift the envelope to the right (emulating a delay of the envelope), the cursor needs to be offset by a negative number. This may seem a bit unintuitive at first, but we need to consider how the offset/placement of the cursor affects how the processing begins. i.e. if it is negatively offset, it will be delayed in processing the envelope data, thus shifting the envelope to the right. Before moving on, here is a new video showcasing these new features, this time with some slightly more exciting audio for demonstration. Lastly, in terms of bug fixing, I had to deal with an issue that arose in Soundforge due to the fact that it does not save the state of a plug-in once it’s invoked. In other words, when a plug-in is opened in Audacity, it is not “destroyed” until the program is exited; it only switches to a suspend state while it’s not active. This means that a plug-in’s constructor will only be called once, thus saving the state of parameters/variables between uses as long as the host isn’t closed. Soundforge does not do this, however, and this caused problems with parameter and variable reinitialization. Fortunately a fix was found, but it has further reaffirmed that VST is not really built for offline processing, and while we can certainly coax them into it, I’ve hit several limitations in terms of what I can accomplish within the bounds of the VST SDK as well as inadequate support for the offline capabilities it does provide by hosts. As such, this might be one of the last entries in this particular making-of series on the Match Envelope plug-in. I have learned a ton through this process, and through sticking it out when it became clear that this particular process is probably better suited to a standalone app or command-line program where I could have had much more control over things. This entry was posted in Audio, Programming and tagged Audacity, beta, cubic interpolation, DSP, envelope, interpolation, NaN, plug-in, Soundforge, VST on August 26, 2012 by Chris. One of the primary issues that I need to address is differing sample rates between the source and destination audio. This is something I have yet to try out in code, but I expect some sort of scaling of certain parameters will solve the problem rather than forbidding mixed sample rates (which would be a bit of a pain). If, for example, we choose a window size of 30ms with the source audio at a sample rate of 44.1kHz, it will contain 1323 samples per window. If the destination audio’s sample rate is at 48kHz, however, it will contain 1440 samples per window. There can thus quite easily be a mismatch in the number of windows in an envelope profile between the two audio streams as well as window boundaries not matching up, which will cause the audio files to not sync or match properly. This brings up another related issue, evident in the UI. The Envelope Extractor contains the parameter for window duration, but what if the user selects a different value for the source envelope and the destination? Right now it results in an incorrect match. Should this be forbidden, or perhaps even ignored by forcing the same window duration on both envelopes? Or perhaps there is a way to turn it into a feature. I am undecided on this at the moment and need to do some testing and exploring of various options before addressing this issue. In addition, I will have to decide on whether implementing user-saved programs is of any use in this plug-in. Currently this functionality is not supported, but I think it would be a good idea to include some obvious presets, and allow users to save their own. This entry was posted in Audio, Programming and tagged alpha, Audacity, envelope, Mac, OS X, plug-in, Soundforge, UI, VST, Windows on August 20, 2012 by Chris. I’m both happy and relieved that progress on making the Match Envelope plug-in is proving to be successful (so far, anyway)! It’s up and running, albeit in skeleton form, on Audacity (both Mac and Windows) and Soundforge (Windows). As I was expecting, it hasn’t been without it’s fair share of challenges, and one of the biggest has been dealing with the UI — how will the user interact with the plug-in efficiently with the inherent limitations involved in the interface? The crux of the problem stems from the offline-only capability of the Match Envelope plug-in. 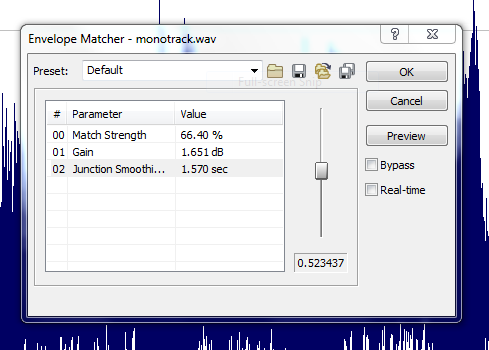 Similar to processes like normalization, where the entire audio buffer needs to be scanned to determine its peak before scanning it a second time to apply it, I need to scan the entire audio buffer (or at least as much as the user has selected) in order to get the envelope profile before then applying that onto a different audio buffer. This part of the challenge I foresaw as I began development. I knew of VST’s offline features, however, and I planned to explore these options that would solve some of the interface difficulties I knew I would encounter. What I didn’t count on was that host programs widely do not support VST offline functions, and in fact, Steinberg has all but removed the example source code for offline plug-ins from the 2.4 SDK (I’m not currently up to speed on VST3 as of yet). Thus I have been forced to use the normal VST SDK functions to handle my plug-in. 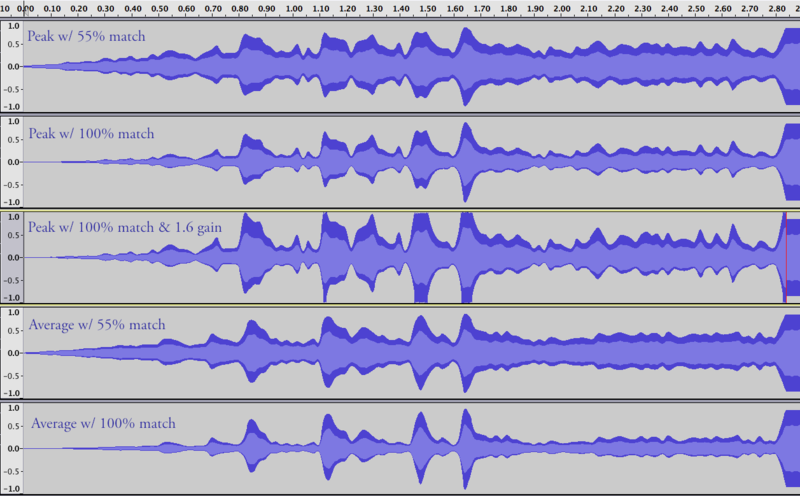 ‘inputs‘ contains the actual audio sample data that the host has sent to the plug-in, ‘outputs‘ is where, after processing, the plug-in places the modified audio, and ‘sampleFrames‘ is the number of samples (block size) in the audio sample data. 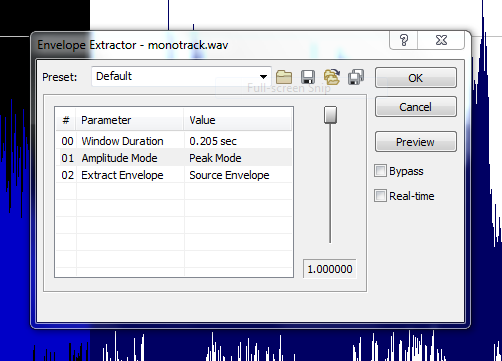 As I mentioned earlier, not only do I need to scan the audio buffer first to acquire the envelope profile, I need to divide the audio data into windows whose size is determined by the user. 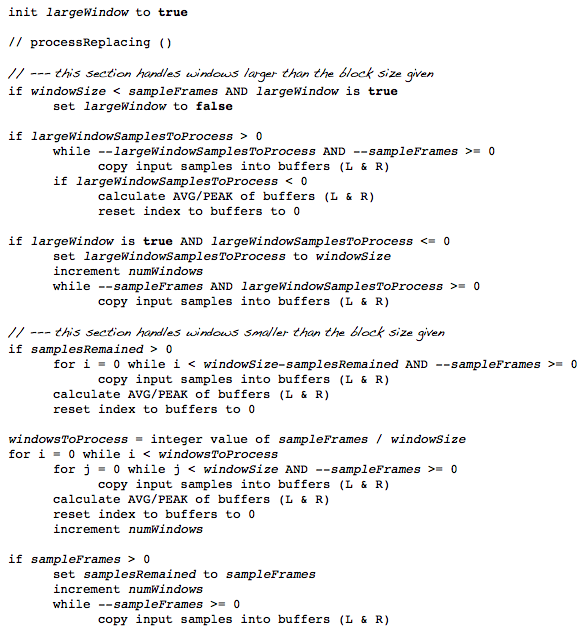 It’s pretty obvious that the number of samples in the window size will not equal the number of samples in sampleFrames (at least not 99.99998% of the time), effectively complicating the implementation of this function three-fold. The code determines how many windows it can process in any given loop iteration of processReplacing() given sampleFrames and windowSize and storing leftover samples in a variable that is carried over into the next iteration. 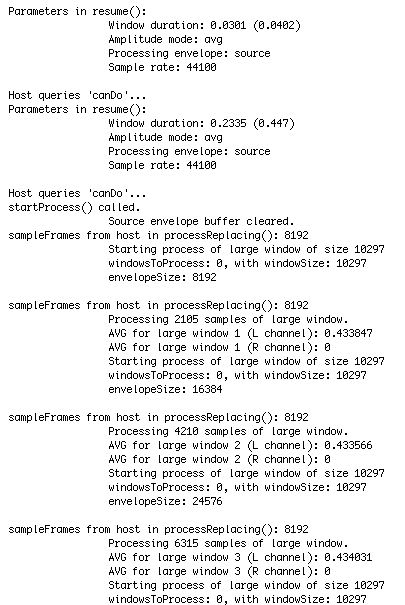 Once the end of a window is reached, the values copied from the audio buffer (our source envelope) are averaged together, or its peak is found, whichever the user has specified, and that value is then stored in the envelope data buffer. The reasoning behind handling large windows separately from small ones is to avoid a conditional test with every sample processed to determine if the end of the window is reached. 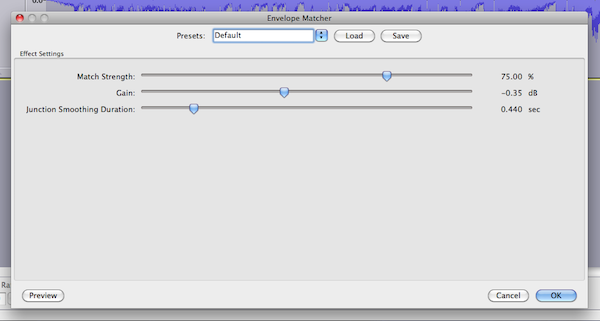 Select the audio to apply the envelope profile onto and process. It became clear that, since I was not using VST offline capabilities, the plug-in would need to be opened and reopened 2 – 3 times in order to make this work. This isn’t exactly ideal and wasn’t what I had in mind for the interface, but the upside is that its been a huge learning experience. As such, I decided to split the Match Envelope plug-in into two halves: the Envelope Extractor, and the Envelope Matcher. I felt this was a good way to go because it separated two distinct elements of the plug-in as well as clarifying which parameters belong with which process. i.e. The match % or gain parameters have no effect on the actual extraction of the envelope profile, only during the processing onto the destination audio. Myself, like many others I assume, like fiddling around with parameters and settings on plug-ins, and it can get very frustrating at times when/if they have no apparent effect, and this can create confusion and possibly thoughts of bad design towards the software. To communicate between the two halves, I implemented a system of writing the envelope data extracted to a temporary binary file that is read by the Envelope Matcher half in order to process the envelope, and this has proven to work very well. In debug mode I am writing a lot of data out to temporary debug files in order to monitor what the plug-in is doing and how all the calculations are being done. Some of these non-ideal interface features I plan on tackling with a custom GUI, which offers much more flexibility than the extremely limited default UI. Regardless, I’m excited that I’ve made it this far and am very close to having a working version of this plug-in up and running on at least two hosts so far (Adobe Audition also supports VST and as far as I know, offline processing, but I have not been able to test it as I don’t own it yet). After this is done, I do plan on exploring other plug-in types to compare and contrast features and flexibility (AU, RTAS, etc. ), and I may find a better solution for the interface. Of course, the plug-in could work as a standalone app where I have total control over the UI and functionality, but it would lack the benefit of doing processing right from within the host. This entry was posted in Audio, Programming and tagged Audacity, audio, Audition, envelope, GUI, offline, plug-in, programming, Soundforge, UI, VST on August 15, 2012 by Chris.